When you hear the word bodysuit, do you think leotard? Me too. SO many of the styles out there are body-con, stretchy and generally not appropriate for anything other than a night out. I had no intention of buying one… that is until I came across this Brigitte bodysuit from Veronica Beard. I discovered it at the store preview in HP Village, and immediately had to try it on. It looks like a plain white button-down, but alas, it is indeed a bodysuit! What makes this bodysuit so great is it completely eliminates the annoyance of tucking a bulky button-down into a skirt, trousers or jeans. I don’t know about you guys, but I always have so much trouble getting certain shirts lie flat, so this bodysuit is an actual miracle. As a long-torsoed gal, I can confirm it fits taller ladies too! There are two rows of buttons so you can adjust the length a bit if necessary, however. I have a larger bust, so I went with a medium which fits perfectly! I wish more designers would create more regular shirts and pretty blouses in bodysuit form – it simplifies the styling process so much! PS – have you donated to Hurricane Harvey relief efforts yet? You can do it easily by clicking here or just text to HARVEY to 90999 and you’ll automatically donate $10. 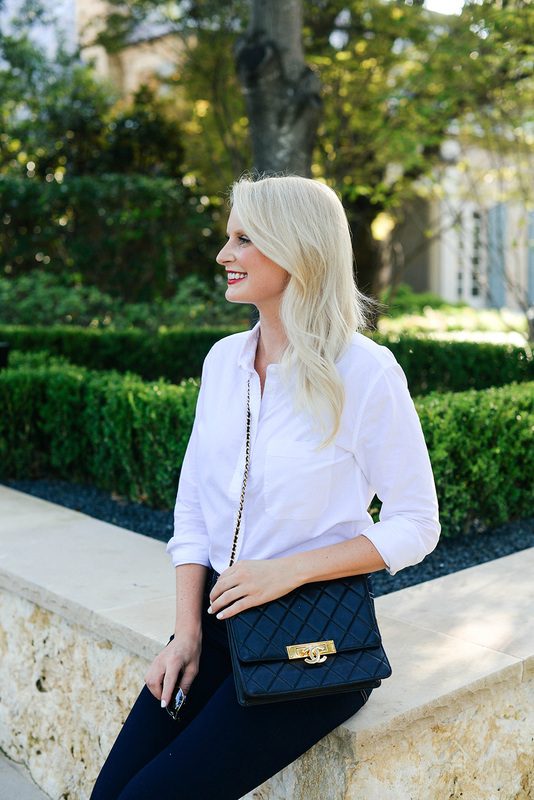 You can also find many more ways to get involved and help out here, thanks to my friend Caroline of House of Harper (a current Houston resident and fellow lifestyle blogger). Houston and the surrounding cities are going to need help long after the storm passes, so please continue to give and support those in need however you can! I Love these heels, this is such a classic look. I love that it is a bodysuit! It definitely eliminates the bulkiness! Greatest invention ever! So good!